B2B marketers are always looking for tips to stay on top of the ever-changing B2B marketing techniques. 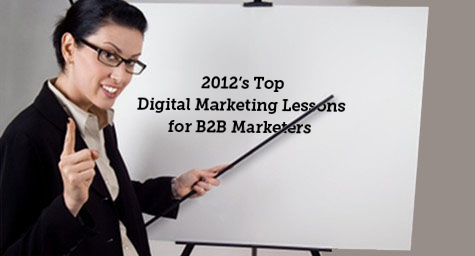 To give these marketers some insight gleaned from the triumphs and trials of 2012, MarketingProfs.com offered the following eight lessons. 1. Manual Misses the Mark – In this high-tech day and age, manual processes are simply not sufficient to handle the complexity and abundance of marketing data. In fact, research has shown that digital marketing campaigns have resulted in conversion rates that were 200 percent higher than those in manual campaigns. 2. Influence Has an Influence – Within each brand’s online network, there are many followers but usually a few leaders who influence the actions and sentiments of those followers. These ‘influencers’ can have an enormous impact on traffic and conversions, so it’s important for marketers to reach out to these influencers and enlist their help in carrying out their digital marketing strategies. 3. Events Have Bonus Benefits – Most marketers view events as ways to generate leads, but they actually have some surprising additional benefits. Research has shown that event sponsors have experienced a 25 percent jump in traffic to their Web properties throughout a conference. In addition, conference attendees have proven to be a company’s best customers and actually generated more leads per marketer. 4. Conversions and Metrics Matter to Marketers – There are two main topics concerning today’s B2B marketers. First, there is the need for standardized metrics that accurately measure campaign performance. Second, there is the complex issue of conversions, from producing them at every stage in the sales cycle to accelerating those conversions and analyzing their impact. 5. Perfection Isn’t Everything – While every marketer desires those ‘perfect leads,’ this can actually do more harm than good. Focusing only on perfectly qualified leads can cause marketers to overlook other prospects that may not be as ideal, but may ultimately prove to be more valuable. 6. More Can Actually Achieve Less – People are increasingly inundated with email marketing, so marketers need to use caution and care when determining the frequency of their communications. Too many emails can cause annoyance, deletion, or complete cancellation from recipients, so it’s often smarter to send fewer emails that contain more valuable content. 7. Sales Enabling Exceeds Simple Sales – Some marketers see their sales teams as simply a means to higher sales, but these reps can actually be useful for maximizing digital marketing. In fact, giving sales teams the tools to share marketing content has led to huge leaps in marketing reach since the sales force has applied its drive and determination to the task of sharing content. Clearly, a sales team can be extremely valuable for much more than sales. 8. Packaging Affects Perception – As marketers know, packaging can have a major affect on performance. This rule also applies to the presentation of marketing data. Statistics can look dry and dull, so use creative layouts and eye-catching details to add more visual interest that will hold the viewer’s interest. To learn more about the latest digital trends in B2B marketing, contact MDG Advertising today at 561-338-7797 or visit mdgadvertising.com. MDG Advertising, with offices in Boca Raton and New York, NY, is a full-service advertising agency and one of Florida’s top digital marketing companies. MDG specializes in developing targeted Internet marketing solutions, exceptional creative executions, and solid branding and media-buying strategies that give clients a competitive advantage. Our core capabilities include print advertising, branding, logo design, creative, digital marketing, media planning and buying, radio and TV advertising, Web design and development, email marketing, social media marketing, and SEO. View MDG Advertising’s creative marketing portfolio.